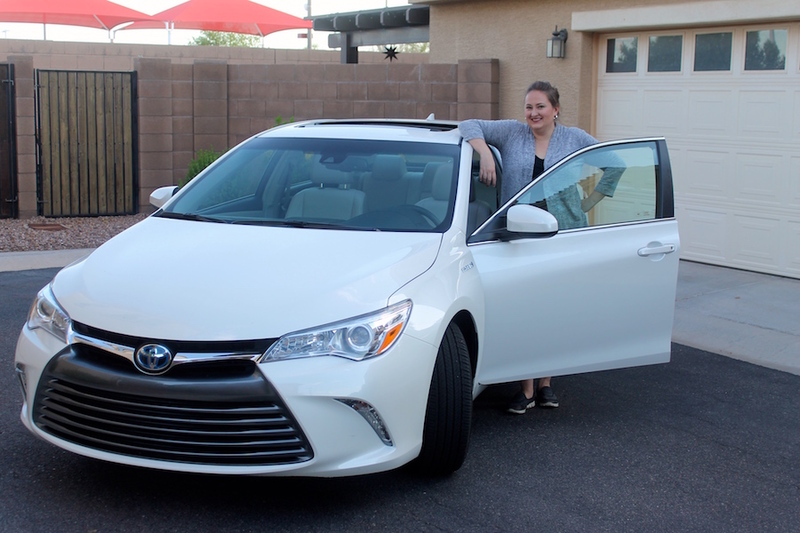 I had the chance to drive a 2017 Toyota Camry Hybrid XLE for a week in exchange for a review. I have to say that we may not own a Toyota currently, I do so love Toyota. I had a Toyota Celica for 14 years. I bought it when I was 21 and I was able to buy it right off the lot brand-new all by myself. I had a great new job and I was so excited. I looked for a Celica for years and when they came out with the new model in 2000, I couldn’t wait any longer. I loved that car and it was hard to trade it in, especially because it still ran wonderfully and I didn’t have a car payment but I had to since we were starting our family and unfortunately, the two-door wouldn’t have worked so well with a car seat. That car was everything for me and it lasted forever and through everything. Through college, my move to AZ and lots of road trips. I had a lot of miles on that car of mine and I never had any real problems with it, ever. It has been a few years since I had to say goodbye to my little Celica, so when I was driving around in the Camry Hybrid XLE it reminded me of how much I loved those years with my car, and how my I love Toyota’s. They all just feel so sturdy and safe. This was the first time I had ever driven a Hybrid before. I had a preconceived notion that hybrids were slow and didn’t have any pick-up to them. It seems they have come a long way. I was super impressed with this hybrid and he great pick-up. When I first started the car, I had forgotten that hybrids are super quiet so I didn’t realize that when I pushed the start button, that I had turned the car on, but that the engine had not started. I was looking for the keys in my purse to make sure the car knew they were close by. I then realized the car was on and I’m ridiculous. It was so quiet! I love, love, love that. What I also love? The crazy gas milage. I drove this car all over the place for the week and I never got close to running out of gas! I can’t tell you how much I despise getting gas. This is enough to get me into a hybrid. So much money saved for all the miles I can get out of a tank of gas, and so much time not having to stop to get gas. And coming into the summer months here in Phoenix, that is a big deal when I can cut my time getting out of the car into 110 degree weather to pump gas. It isn’t just the hybrid part I loved about this Camry. With having a little one that will still be in a car seat for a few more years, having space in the backseat is imperative. I buckled the car seat in and there was plenty of space for the car seat and for my baby to extend her legs. I was pleasantly surprised. 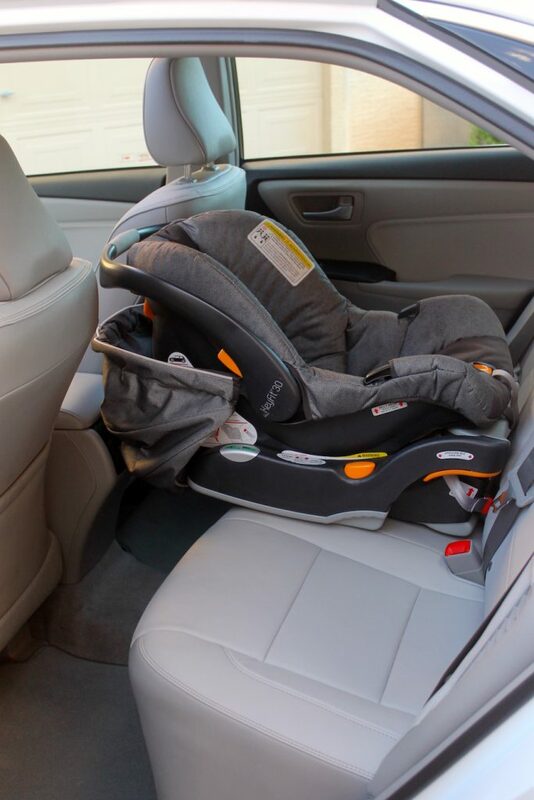 I currently have an SUV and I thought that I needed to have an SUV to fit the car seat, but in reality, it was easier to get my daughter in-and-out of the sedan than I assumed. 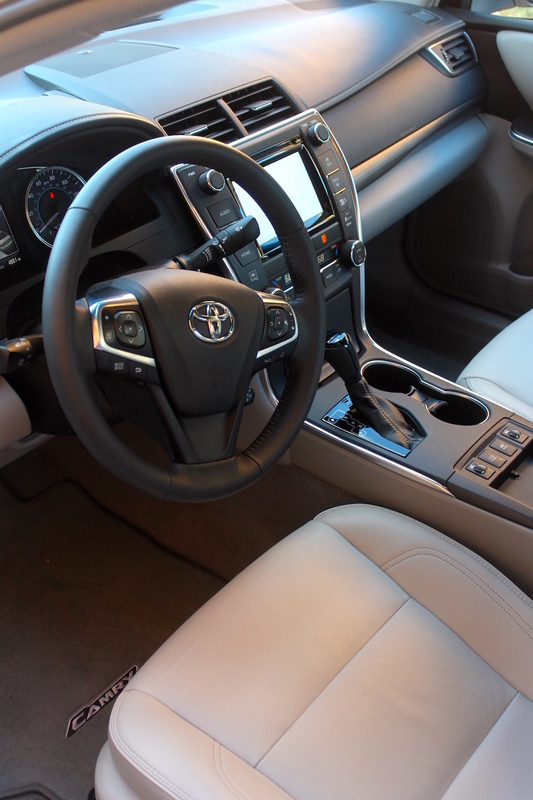 Everything with this Toyota Camry Hybrid XLE is high tech; from the digital speedometer to the large high resolution touch-screen GPS and HD radio screen. It also has bluetooth, voice recognition and hands-free phone. For me, my favorite features are the keyless start, keyless entry and the back-up camera. They really are life-changing options. I love that I don’t have to dig around my purse or diaper bag for keys. It is glorious to just walk up to the car holding my baby, purse, diaper bag and phone and not have to dig to find my keys. Just touch the handle the car is unlocked. It is the best! Oh and the sunroof, can’t forget to mention the sunroof! Something that is really important to me is car safety rating. 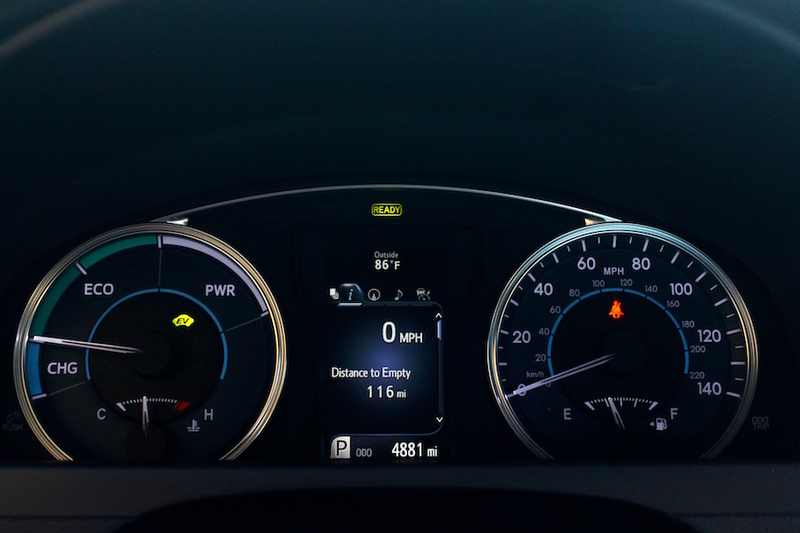 The overall vehicle score for the Camry Hybrid XLE is 5-star with 5 being the highest. Just a couple of years ago I was in a roll-over car accident and it was the scariest car accident ever, so safety is super important to me. I definitely felt safe in this car and to have the safety ratings back it up, makes me feel good about having my family in tow. 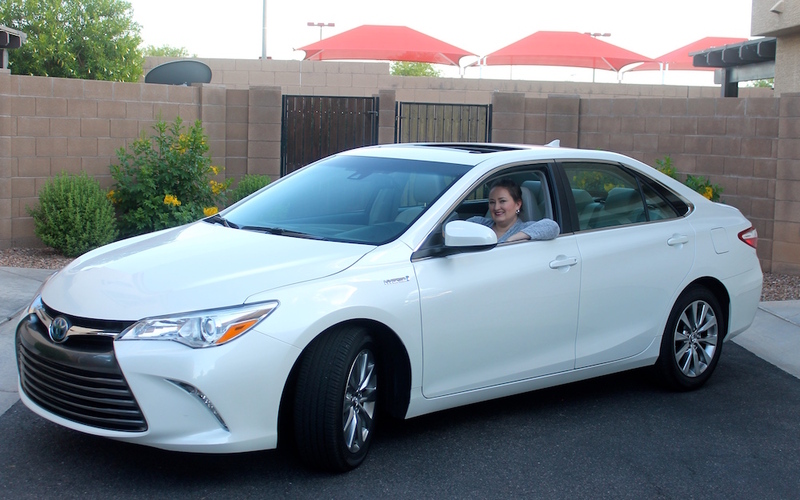 I had a great time in my Toyota and impressed with it in every which way, especially how it drove so smooth, quiet and the crazy awesome gas mileage. Looks pretty good on me, eh? 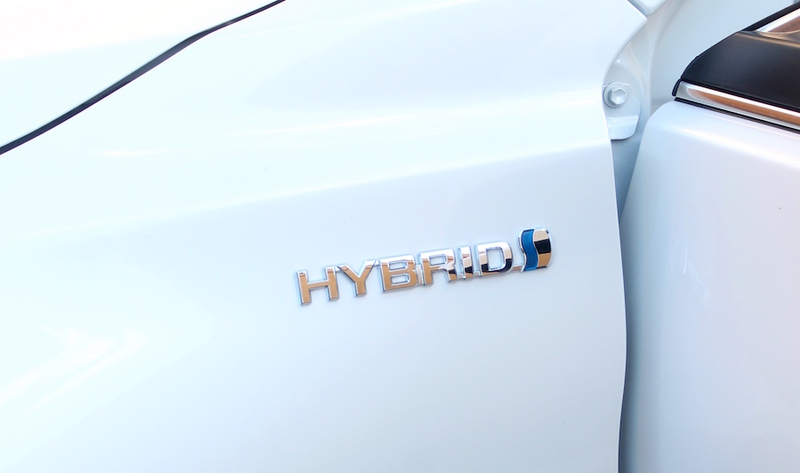 Have you ever driven a hybrid? What did you think? 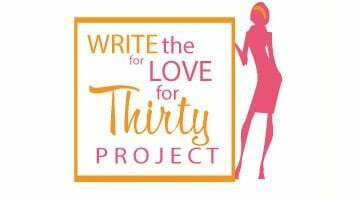 I would love to hear your thoughts in the comments.